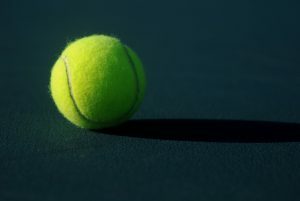 The high shot in tennis is a ball hit above shoulder height. Most beginner and intermediate players struggle with hitting the high shot in tennis, even on the forehand side. If you can’t handle the high ball, then you’re always going to feel uncomfortable playing tennis. Furthermore, opponents that hit with topspin or loop the ball to you will always pose a threat. In order to reach the next level in tennis, it’s critical to effectively deal with high shots, particularly on the forehand side, which is your strong side. 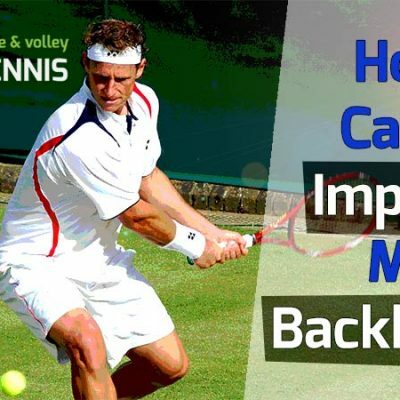 The backhand side is a lot more difficult for several key reasons, but we’ll focus on it in a different post. It took me several years to learn how to successfully deal with high forehands in my tennis game. Once I did, it made the game a lot easier and I was able to beat massive topspin players I couldn’t before. 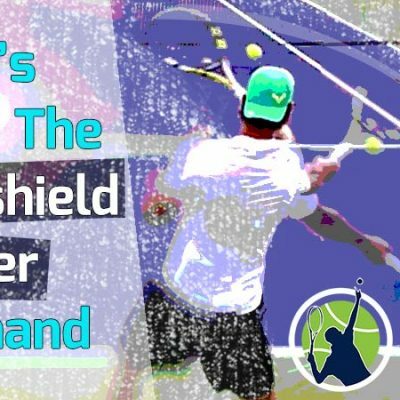 In this post I’m going to talk exclusively about how you can effectively hit high shots off your forehand side. If hitting high shots is placing you on the defensive and causing unforced errors, this post is for you. When dealing with high forehands, it’s essential we know the following. These points are critical to success on high forehands. I will go into detail on each one of these points. 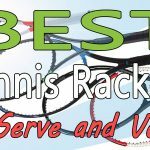 If you can put them all together, not only will you be able to hit high forehands comfortably, you may even be able to crush them back to your opponent. If you hit with an eastern forehand grip, you’ll want to change to a semi-western grip when hitting high forehands. The eastern forehand grip has your index finger knuckle on the third bevel of the racket. For the semi-western grip, you’ll be moving your index knuckle to the fourth bevel. This will cause the racket head to turn down more, allowing your forehand shot to stay in the court. If you remain in the eastern forehand grip on the high shots, you run the risk of hitting long. I know the grip change may seem awkward at first, but I promise you’ll get used to it. When I hit a high forehand, I automatically hit with the semi-western grip. It’s not something I have to consciously think about it. If you play enough, you will automatically assume the correct grip on every shot. When practicing the high shots, make sure your grip changes to the semi-western. A lot of players aren’t aware of their grips when hitting the ball so look to see where your hand is after striking the ball. One last thing here. If you already hit out of the semi-western grip (or even the western grip), you don’t need to make a grip change. When hitting high forehands, you’ll want to set up in the semi-open or open stance. 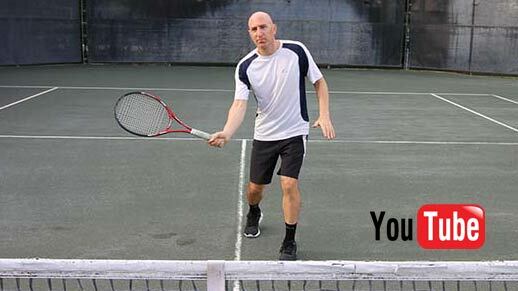 See this post for the different stances in tennis. If you try to hit a high forehand out of a neutral or closed stance, you’ll likely make an error. This is because the neutral and closed stances do not allow for sufficient body rotation into the ball. If you’re a long-time player who prefers a traditional neutral or closed stance, it could be challenging to change to the open stance. The open stance allows more versatility and torque. Even if you don’t generate massive racket head speed on your forehands, it will be easier to deal with the high ball from the open stance. 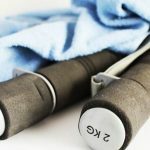 If you’re young and athletic, it should come fairly easily to you. When preparing for the high forehand, you’ll be in a more upright stance than on lower balls. By upright, I mean your body will be more vertical. On lower shots, you’ll have a bit more of a tilt to your body. It’s also important to load a bit on your right leg by bending it and placing pressure on it. Lefties will do the same on their left leg. This helps generate power. Here is how I set up for high shots on my forehand. When the ball is on its way and I identify it’s going to be high, I start setting up in the open stance and change my grip – usually at the same time. Since high balls usually take longer to arrive, you’ll have the time to set up – especially if the ball is coming right to you. It’s important the grip and stance are correct for the rest of the shot to work. The swing path of the high forehand is different than for low or medium-height shots. On low or medium height shots, you can really dip your racket under the ball significantly. However, on the high shots, it’s not necessary to dip the racket so low. You’ll want to get only slightly under the ball before hitting it. Once you strike the ball, the swing path will be much more across than up, especially on the drive shots (those with pace). If you’re a beginner, you may have been told to swing low-to-high on all your shots. A drive shot where you are hitting with pace and less topspin. Let’s talk about the drive shot first. You’ll want the racket to start only slightly under the ball – perhaps 6-8 inches. Strike the ball and then allow the racket to move across your body. To simplify things for my beginner students, I demonstrate the high swing path. It will basically go straight across (after hitting the ball), so it remains the same height from the ground. While this is an over-simplification, it works because it helps my students better visualize and execute the swing path. You may be thinking this swing path won’t work because we need to lift the ball over the net by swinging low-to-high. However, on high shots, we can swing across (with no up or down trajectory) and allow gravity (and a little topspin) to bring the ball down into the court. The faster you swing, the more you’ll need to lower your follow through – perhaps to under the shoulder. Also, the closer you are to the net, the same applies. You’ll need to follow through lower. 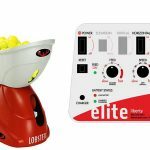 The best way to practice the high shots is with a ball machine. Stand a couple of feet in back of the baseline and practice hitting forehands at shoulder-to-head height. Adjust your swing path and swing speed until you are hitting consistently in. Notice what happens if you slow your swing speed or lower your follow through. 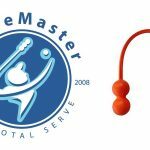 Now, if you plan on returning a high forehand with topspin, you’ll need to get under the ball a bit more (12-18 inches). You’ll also have a more vertical follow through – basically hitting low to high. Often, for these shots, the buggy whip follow-through works well. This follow- through was popularized by Rafael Nadal early in his career. It’s really his signature move. In order to counteract a heavy topspin shot that is rising to your forehand, you’ll need to meet it with force. This means racket speed. To achieve high racket speed, you’ll need to drive up from the legs out of the open stance. If the racket is coming from a bit lower than the ball (12-18 inches), you’ll have more time to build up racket speed as well. When making contact on very high balls, the angle of your racket should be slightly vertical. This concept can be confusing. It really helped to me visualize the head of the racket being higher than the hand. That’s what I mean by “vertical”. On low and medium-height shots, you would never do this. But once the ball raises to around head-height, you want the racket head to be above your hand. This applies to both the forehand and backhand side. A vertical racket head will allow the power to come more from the chest and core, rather than the front deltoid. If you lift the arm too high, you’ll be using much weaker muscles and lack power. That’s what you’re likely doing on your current forehands, which is why the high shots feel awkward. It comes from raising the arm too far up and not having the right technique. However, it doesn’t have to feel like that or be that way. Give my suggestions a try and watch the video here to understand the technique better. A lot of beginner and lower-level intermediate players struggle with rotation. When I say “rotation”, I mean the pivoting and turning of the entire body – shoulders, hips and feet. For righties, the chest will face to the right at the start of the stroke and finish facing to the left at the completion of the stroke. I think good rotation is difficult for some people because it requires athleticism, coordination, and good timing to execute right. If you set up properly and swing across your body, you’ll naturally have some degree of rotation. That’s just the natural mechanics of the body at work. But I see many players struggling to rotate fully. Lower level club players may only rotate half way. And some not even that much. When swinging out of the open or semi-open stance it’s crucial to rotate fully. Unlike the neutral or closed stance, where we can transfer our weight forward, it’s not possible from the open stance. From the open stance, the way we generate power is from racket speed and body rotation. This will sometimes cause us to take flight, even if a couple of inches off the ground. That’s perfectly fine. When initiating the swing on the high forehand, you’ll be pushing mostly off your right foot (if you are right-handed). When making contact, both feet might be in the air. The left foot should land first after rotation has completed. If you are not a high-flyer or not as athletic, you can keep both feet on the ground. Just make sure you’re pivoting on the balls of your feet. I think a lot of lower level players don’t rotate properly because their hitting with their heels on the ground. If you do so, it’s nearly impossible to rotate. Additionally, the feet may be pointed in the wrong direction. 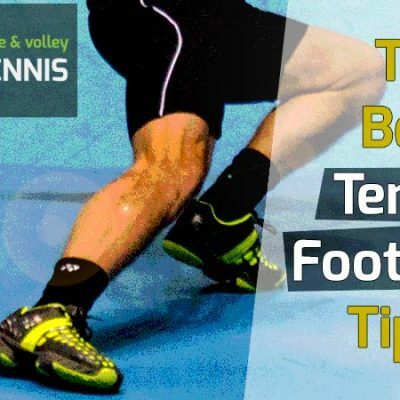 If your toe is pointed to far to the right (so that your foot is almost parallel to the baseline) it will also be nearly impossible to rotate. Check out the video for how to properly set up the feet. 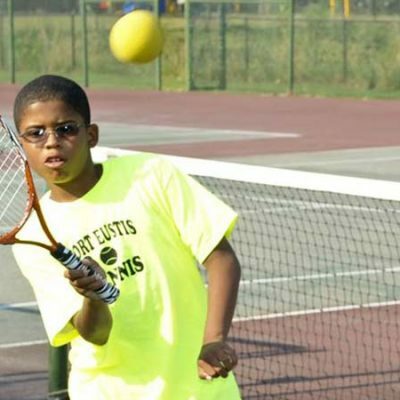 The high forehand is a shot that takes time to master. This is because there’s no one-size-fits-all solution, such as on the serve or the volley. 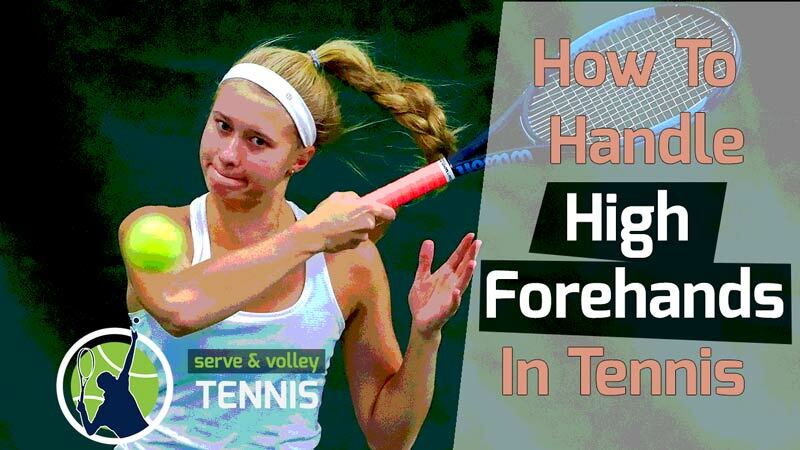 There are too many variables on the high forehand, which makes it a bit complex to teach. 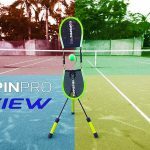 It really depends on how much topspin is on the ball, where you strike it on the court, the height you hit it, and how much pace or spin you wish to apply to the ball. Again, practicing on a ball machine is your best bet. You could also practice with a hitting partner or hit against a wall. Video yourself to make sure you are doing everything properly. In time, you’ll find hitting the high forehand more and more comfortable and won’t struggle as much. You’ll also cut down on the errors and may even be able to hit offensive shots back. Keep these two points in mind on all high forehands. If you want to safely get the ball back in play, use the topspin swing path. If you want to hit hard, then use more of the drive swing path. Once you get it, you won’t fear the high ball anymore. When I first started playing tennis, I could handle the low ball well, but high shots killed me. Topspin hitters were my worst matchup. 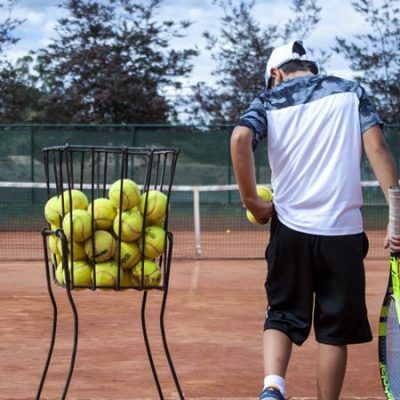 It’s an incredibly rewarding feeling to be able to handle any shot in tennis – and even rip the cover off some of those high forehands once in a while! 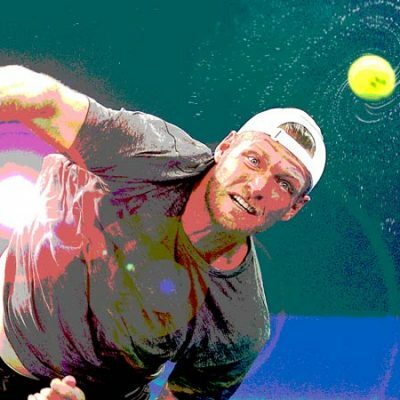 If you have any questions for me about hitting the high tennis forehand, let me know below. Thanks for stopping by my blog.